This year’s conference is included within the International Meeting of the Society of Biblical Literature, and will explore the (theo)political visions of authoritative/sacred texts in their historical contexts. It is aimed at graduate students and early career scholars, welcoming contributors from the following fields of research: Old Testament / Hebrew Bible, Pseudepigrapha & Dead Sea Scrolls, New Testament, and Early Christianity. We are welcoming 250-word abstracts via email at db47@st-andrews.ac.uk by the 1st of March. Non-SBL members are welcomed. ‘Apocalyptic’ texts and political theology. The 2nd St Andrews Graduate Conference for Biblical and Early Christian Studies is aimed at graduate students and early career scholars. Contributors are welcomed from the following fields of research: Old Testament / Hebrew Bible, Pseudepigrapha & Dead Sea Scrolls, New Testament, and Early Christianity. In addition, we will also have a special invited lecture from Dr. Grant Macaskill (St Andrews), on his edition of the Slavonic text of 2 Enoch. 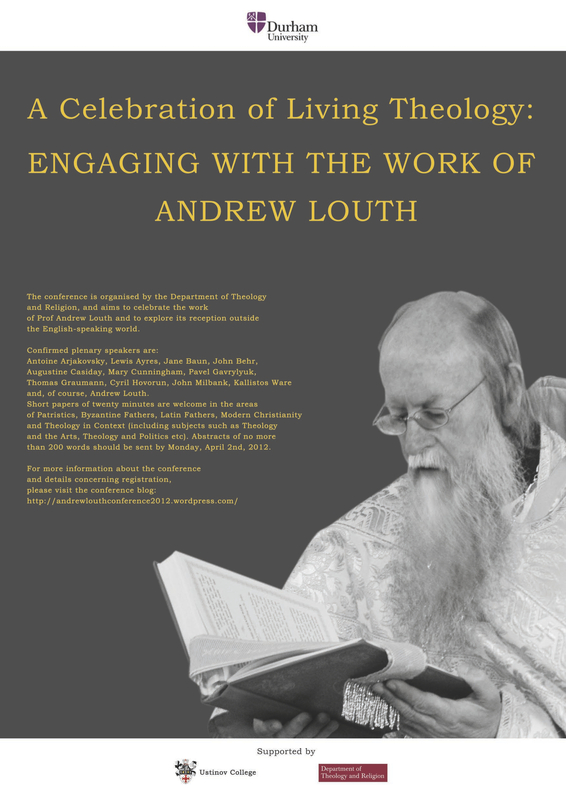 Durham University in conjunction with the Department of Theology and Religion will be hosting the conference ‘A Celebration of Living Theology: Engaging with the work of Andrew Louth’ on 9-12 July 2012 at Durham University. 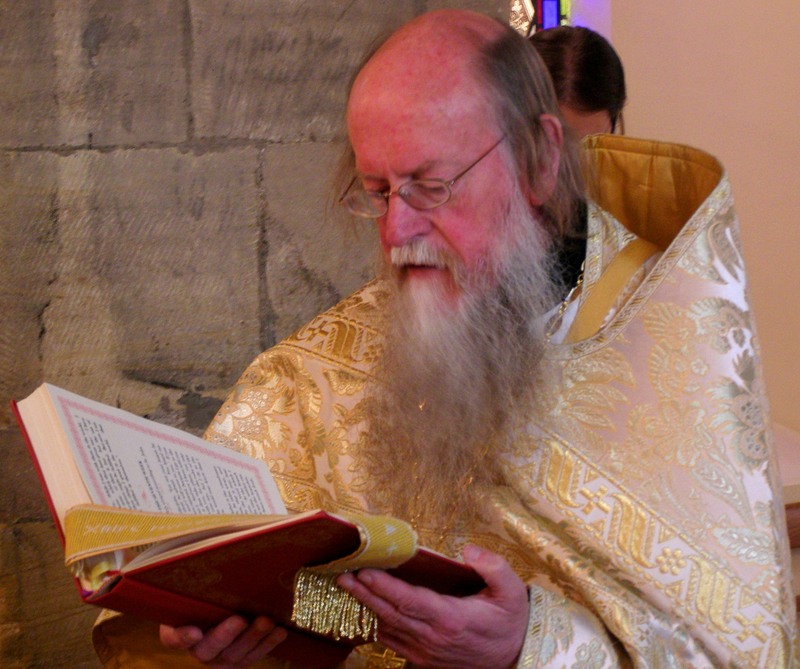 The conference aims to celebrate the work of Prof. Andrew Louth in the areas of Patristics, both Western and Eastern, Modern Theology and Theology as Life, as well as explore its reception outside the English-speaking world. Durham University in conjunction with the Department of Theology and Religion will be hosting the conference ‘A celebration of living theology: Engaging with the work of Andrew Louth’ on 9-12 July 2012 at Durham University. brought together in conversation about a biblical text. With the book of Galatians as our key text, biblical scholars and theologians of the Christian tradition will gather to work out how exegesis and theology meet, critique and inform each other. Registration will open shortly, here. 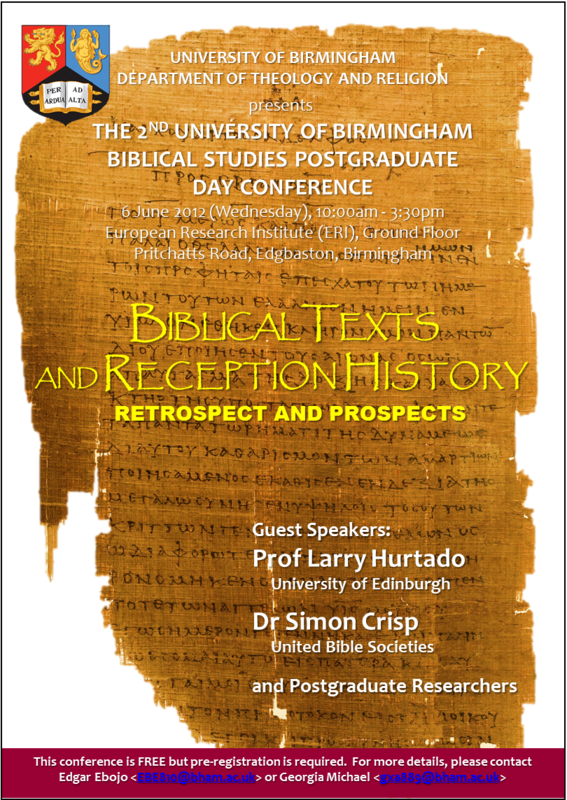 With an emphasis on textual reception history, the first St Andrews Graduate Conference for Biblical and Early Christian Studies is aimed at graduate students and early career scholars. Contributors are welcomed from the following fields of research: Old Testament / Hebrew Bible, Pseudepigrapha, Dead Sea Scrolls, New Testament and Early Christianity. Some other details, here. Information about registration are posted here. You can download the conference poster from here. Conference sessions will be chaired by plenary speakers followed by papers grouped by topic.